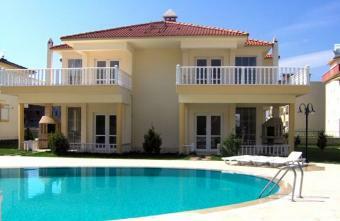 Palm Villas are located close to the excellent 3rd beach of Altinkum. The villas are spacious (about 150sqm), bright, airy and very comfortable with every villa overlooking the gardens. There is a communal swimming pool and garden for your enjoyment and relaxation. These semi-detached villas consist of 3 bedrooms, an open planned kithen, 1 bathroom and 2 wide balconies. You can see high quality workmanship and building meterials it these villas. Features: Double lock steel entrance door, fully tiled bathroom, dual purpose air conditioning, satellite TV system, UPVC double glazed doors and windows, french doors. Shopping: An excellent selection of shops with jewellery, clothes, shoes, beachwear and water-sports equipment. Many small, well-stocked minimarkets. Souvenirs and local handicrafts; plentiful spices, teas and Turkish delight. Didim town has an abundance of shops and Didim Market (Saturday). Activities: Sailing, water sports, Aqua Park, Turkish baths and massage. Nightlife: more low-key, with a good selection of bars, cafes and cocktail bars, many on the beachfront boulevard and with bay views. Larger hotels offer seasonal evening entertainments with live music and often belly-dancing. Public Transport: Frequent dolmus (minibus) to Kabuki and Bodrum. Car, bicycle and mopeds are all available to hire and plenty of taxis are available around the resort and local area.